With versions of (1) and (2) nailed (future posts about them coming up soon!) it was time to try number (3). Martin Luther King Day = long weekend. For those of you still in short pants who think MLK is text speak for ‘Missing you Like Kerazy’, Martin Luther King was an American civil rights activist who won the Nobel Peace Prize in 1964 for his work to achieve racial equality. He was renowned for his evocative speeches “I have a dream that one day on the red hills of Georgia the sons of former slaves and the sons of former slave owners will be able to sit down together at the table of brotherhood”. Gets your blood pumping. Like Kennedy before him, Martin Luther King was sadly assassinated, as the song goes “Early morning, April 4, shot rings out in the Memphis sky, free at last, they took your life, they could not take your pride, in the name of love...”(every Irish person reading this is now singing it out loud, you know you are). In honour of MLK we decided to scoot out of ‘the city’ (btw, acceptable ways to refer to San Francisco include ‘the city’, ‘SF’, juuuuust about ok to say ‘San Fran’, but never ever say ‘Frisco’, they will dump you in the Bay and ship you to Oakland). Holiday traffic embraced us in a headlock but repeat playings of the Beatles Abbey Road album and R&R stops at In n’Out Burger got us through the 6 and half hour road trip. Tahoe city, c’mon guys ‘city’?, c’mon, it’s a village, a hamlet, a crossroads if you will. It’s pretty and all but ‘city’ it ain’t. LakeTahoe is beautiful, especially when the ski lift whisks you to the tippy top of the mountain and you sweep your eyes over the incredible scenery below. 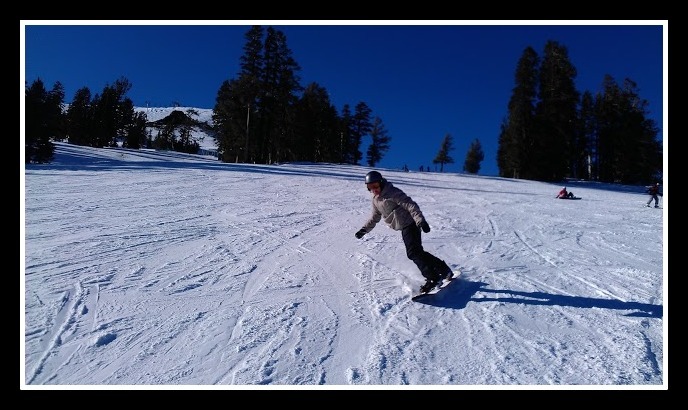 We stayed in Squaw Creek Resort which is a grand spot, it sells ski passes, you can hire your gear there, and there is a chair lift beside the hotel to get you up and out there without horsing your skis hither t'hither. However, if you don’t fancy skiing/boarding across to the main mountain in Squaw Valley, you can grab their free shuttle bus that heads off every 15 mins. From my one experience, I will happily make a definitive statement that skiing in the States is a hell of a lot nicer than skiing in Europe. I’m not saying everyone would prefer it cos ‘nice’ skiing isn’t necessarily what everyone is looking for on the slopes. In Tahoe the runs are ridiculously wide so even on a busy weekend you feel like you’re out there on your own, it’s actually quite a thrilling feeling, ‘Top of the world Ma, top of the world’. 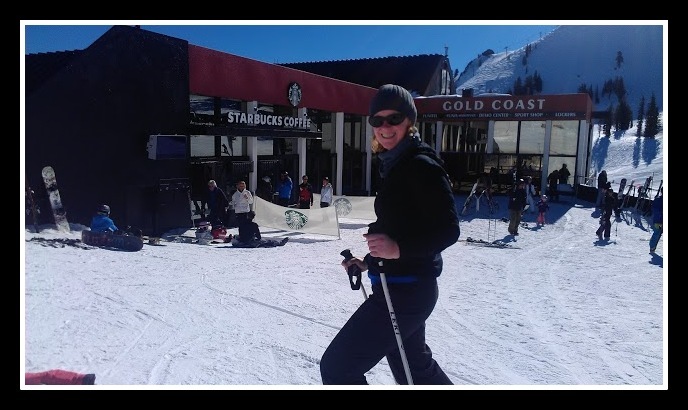 There is also a ski-thru Starbucks on the side of the mountain, I got very excited when I saw that, sad but true. Plus it’s hot up there! The sun beats down while you (ava)launch yourself into the white stuff. After day one I was sporting a gorgeous sunburn with nicely defined panda eyes (that’s ok to say in the States right? Panda eyes, as in I had white marks where my sun glasses were). 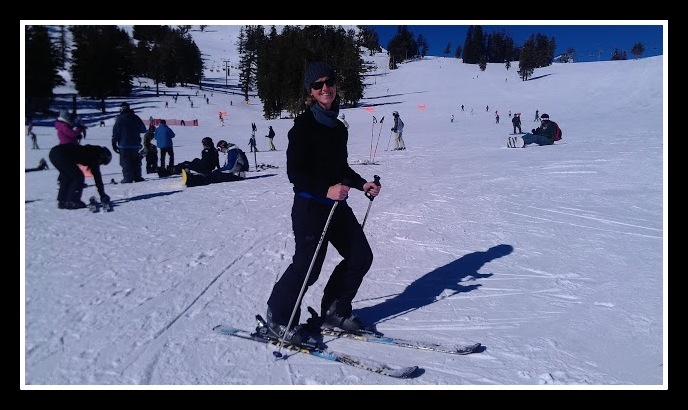 To trigger muscle memory and get my ski on, I took a lesson. The teacher was the spitting image of TV’s Pat Butcher, definitely not who I was picturing when I signed up for a ‘ski instructor’. She was outrageously politically incorrect with comments like “See all those black people on the mountain? Don’t normally see any of those, it’s cos of Martin Luther King Day”. While standing very close behind a big man wearing a jacket with a spider logo on it, “See that guys jacket, I hate it, I hate spider clothes”. Shouted to me, as a teenager with a facial disfigurement helped us onto a lift “What’s with that guy? He looks like someone hit him in the face with a frying pan, maybe it’s a congenital defect, let me get closer.” !!! Mad mountain woman aside, the weekend was blissful, so much so that we’re off to Utah this weekend for more skiing and an overdue catch up with our sisterwife and brotherhusband, Finn and Killian. Dear Beyond The Pale, is it true that Martin Luther King spent most of his early career sleeping (in preparation for his "I had a dream" speech)?? That aside, I loved your post especially "maybe it’s a congenital defect, let me get closer".